I am so excited to be having a Gina K weekend on the 12 Days of Christmas! Today I am taking apart the Merry and Bright Stamp Kit - so amazing with (2) 6x8 stamp sets, three coordinating dies and 24 sheets of the amazing Gina K cardstock all for $59.96 (value $123)! I wanted to show off three completely different looks to show just how versatile this card kit is. It truly is amazing. Gina is also so generous and is sponsoring a $50 gift certificate for one lucky winner which will be announced November 10th! Get your Merry and Bright Kit! I started off very simple for this card. I stamped the ornament once along with the sentiment and embossed them in gold. As simple and pretty as they looked, I wanted more. Using some post it notes, I masked off the ornament I embossed and added one more. I just couldn't stop so I added a third. I love how the designs in the ornaments are stretched to make it look round! 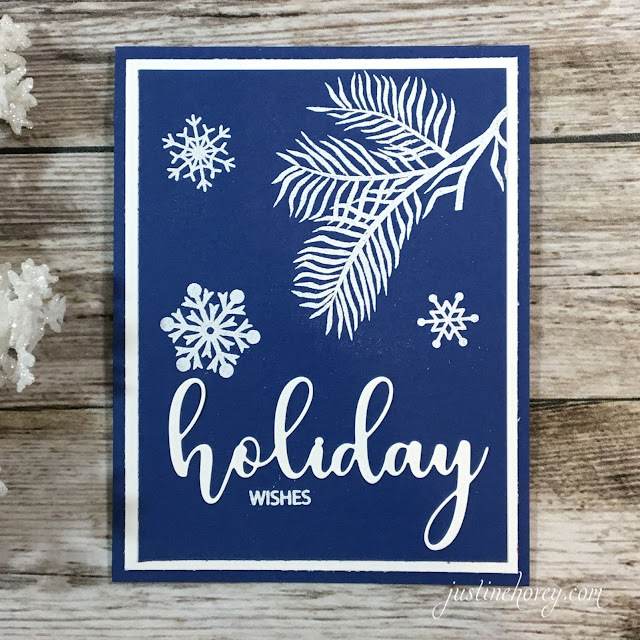 This is the ultimate bulk holiday card because it involves stamping four stamps at the same time using versa mark ink, embossing in white and mounting it onto some cardstock. It is so simple and elegant and only takes minutes. You can also use the Hanukkah or Christmas dies instead of the Holiday. I'm all about white frames. I think adding that card panel on top of a card base makes everything look so clean and finished. This card was relatively complex for those who have some time. I embossed all of the pinecones using copper embossing powder and die cut them all using the coordinating dies. I then glue them all onto a piece of cardstock and die cut them using a stitched rectangle die. I stamped the Christmas sentiment and cut it using the coordinating die. Thank you Gina for sponsoring today's giveaway! Beautiful cards, love the embossing, so elegant! Awesome kit too. Thanks Gina for sponsoring the post today and your new kit is so awesome. Love the stamps in it. Gorgeous embossing! Love the ornament! This is the most amazing card kit. I love the versatility you demonstrated with your cards. I love each of them. The ornaments are gorgeous, but my heart belongs to the pinecones. Thank you, for this fabulous series of videos. Love the ornaments! So simple yet elegant! Pine cones are perfect.! Thanks for video! I love these cards, they are simply gorgeous. Thank you for this wonderful series. Beautiful cards. Love the ornaments and snowflakes. Thanks for sharing your technique video. Gorgeous cards!! Love those stamps and dies! Thanks for showing these cards! I absolutely love the blue and white one! And the trick to use scrap paper was so good! Beautiful cards. Love your ideas, will be spending the rest of the day copying your designs on these three cards. Thank you so much for sharing your talents with us and being such an inspiration. Wow I love your cards and the kit - I think I must have it!! Wow Justine - these cards are so pretty. I think I might have to get that kit - so beautiful and a great value! Beautiful cards! I love embossing - the magic of it just never gets old. I love the beautiful and bossing you did on these cards! My favorite is the ornaments because of its delicacy. Great kit! I love the embossed pine cones. So pretty! Love embossing and the Gina K stamps and dies are beautiful! Love to have this set!! Thanks for sharing! I love Gina K and can't wait to one day have her inks, the first of many things on my Gina K wish list! Love the copper, it's elegant and classy great idea Justine! Love all 3 cards you made! They are beautiful! My favorite is the white embossed on the blue background. Thanks for sharing. These are beautiful cards, Justine! My fave (I think) is the blue and white one. Beautiful cards! Love the kit. Wow , you have given me some great ideas for cards . Love gina k Christmas card kit to.Thank u for sharing! Another great video will tons of ideas and a great giveaway! Thanks! Love the video and your cards, and that card kit is a great deal, very generous! I adore embossing,your cards are beautiful. Beautiful cards! Fantastic kit! Just love Gina K products. Loved all the cards-what a nice card kit for the holidays. Gina K Designs created a beautiful card kit! I love the way you showcased them Justine! The ornament stamp is gorgeous! Such a nice giveaway! I would love to be able to welcome this kit home! Wonderfully made cards, I can see how this kit would stay in someones collection for many years. Justine, these are all so beautiful. I have to say I enjoyed seeing this kit, it is def. a great value. Those dies/stamps are wonderful and you have certainly done the kit justice. Such gorgeous cards. Well done! What an amazing set! A truly must have for cards, invitations, framed decor, so much! Thank you Gina K Designs and Justine for showing them off to us!! I love your demonstrations; so many ways to use that kit. 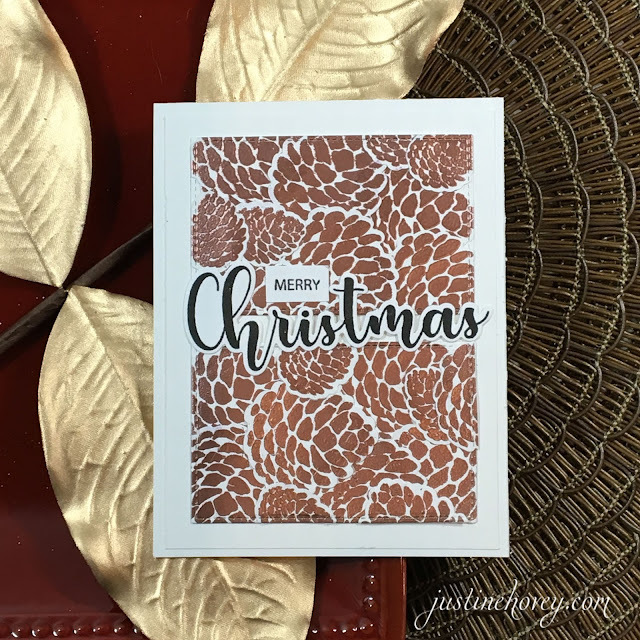 Heat embossing is my favorite way to add details to my cards. I watched the video first. I look forward to them. I love what you did with this kit and what a generous donation from Gina K. I love how the crafter work unites :) I love all these cards you created and I love that you used mostly what was in the kit. I think it helps to show how well designed the kit is. How fabulous how much card stock comes with the kit too! Gina K will be proud of your presentation! With a beautiful kit like this, one can't help but make beautiful cards! Beautiful cards! Love the kit! Such beautiful cards and each so unique. What a beautiful and elegant card kit from Gina K. Knocked it out of the park again. Thank you for the inspiration. Beautiful cards! I especially love the ornaments and the pinecones! Beautiful cards!!! An what an amazing card kit!!! TFS!!!! Justine, this is a beautiful set & so worth it. You have given me more ideas on how to use it with the supplies I have. Thank you for doing this event & Gina K Designs for sponsoring today’s giveaway. Awesomely beautiful cards and some good ideas to try. Love Gina K Designs and her products. She really takes care of her customers. Lovely elegant cards. What a wonderful set. Love Gina K kits. Your cards came out beautiful especially the third one. At first I thought they were Mums but realized they were pine cones, what a unique idea. I just got this kit in this week and can't wait to try it today! Beautiful kit. Love those intricate stamps. Beautiful cards, TFS! Gina K has the most wonderful crafty products! I love the holiday ornament, it's gorgeous embossed in gold! Your series is crazy good! I haven't made holiday cards before but have now purchased multiple sets to be Just Like Justine. Absolutely amazing cards. I love the beautiful simplicity of them. Gorgeous cards. I especially love the gold ornament one. Black and gold is so elegant for Christmas cards. The cards turned out beautiful! I love the embossing of the pine cones. Love all the cards. 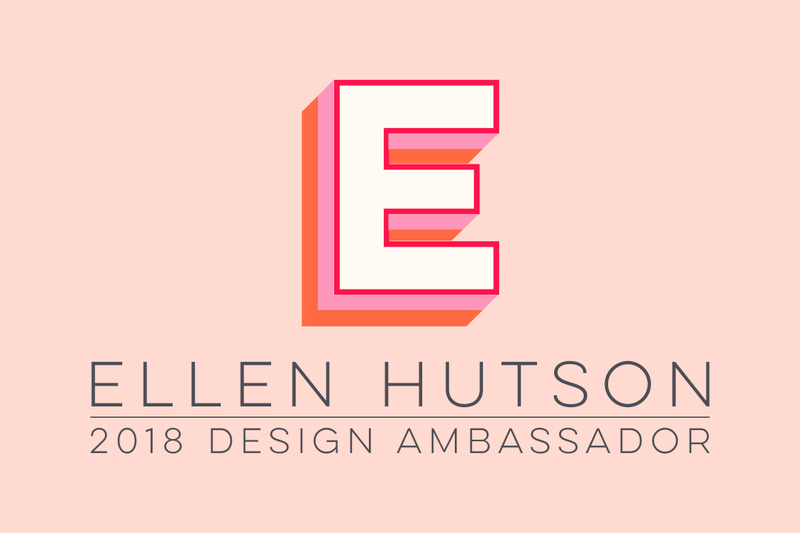 Will have to order the kit now! I especially love the blue card! But all 3 are gorgeous! Love all of these beautiful cards! Lots of wonderful cards you created with this kit. I like the copper embossed pinecones. I like the elegance of your cards. Three stunning cards! I am crazy about the pinecone card, just love it! 3 beautiful cards Justine, you are such a great teacher! I learn so much from watching your videos! Super gorgeous cards! 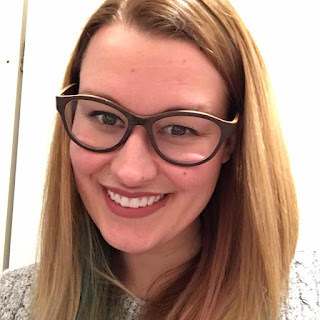 I’ve been a fan of Gina K from the beginning and your take on her products is just lovely! Think the pine cones might be my favorite! Beautiful cards with using Gina K and embossing powders.. These cards are absolutely luxurious !!! These cards are so beautiful! This kit really looks awesome! Thank you so much for sharing! Beautiful cards, love the embossing, so elegant! It's hard to pick a favorite. Such a versatile kit. Beautiful cards and I love the embossing! so pretty and elegant. Very pretty cards! They are so elegant! Love the kit, had to go order after seeing this! I absolutely love these cards! Especially the pinecones! They can be used fall and winter, not just holiday cards! Thanks for the inspiration and the tip for using leftover die cut bases in my card. 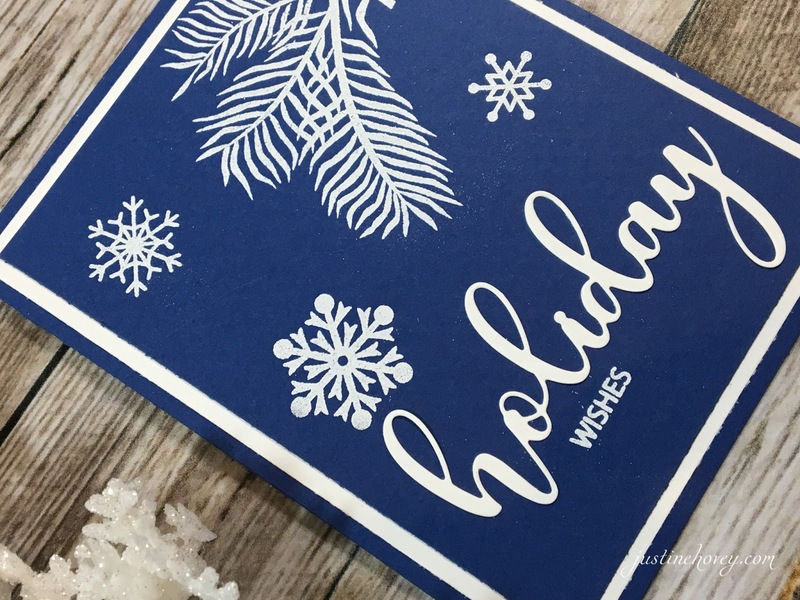 Beautiful holiday cards! The embossing and shine are so pretty. Love this kit! Especially love the ornament stamp!! Thanks for sharing your beautiful cards! This Gina K kit is just amazing and your use of the ingredients is just as amazing! These 3 cards are absolutely stunning. My fav is the the pine cone card. Swoon! I would love to see the rest you made with this kit that didn't make the cut for the video. You made three stunning cards from this card kit. They really made me want the kit! I didn't know Gina K made card kits. Great card kids! Lovely cards, thanks for sharing! Unique cards...well-designed kit. Thank you for sharing. Love these cards! They are wonderful and so is the kit. I still need to make a few more to send my donated cards. Great inspiration. Beautiful cards. Love the versatility of the card kit! Beautiful and thanks for sharing! Really gorgeous cards! I love the embossed ornaments! Copper embossing powder for the pine cones is perfect. Thank you for sharing these and the beautiful Gina K stamps. The stamped images are so detailed and beautiful. I really like the look. Very classic. Love all three cards but my favorite is the gold ornaments. Thanks Justine and Gina K. I'm ordering this kit now!! I love your cards! I bought this kit but haven't used it yet so I'm happy to gather more ideas for it! Very pretty cards. Enjoyed the tutorial. Thank you. So beautiful! Especially those gorgeous gold ornaments! I love the Stamp Set Kit and the creative cards you made! 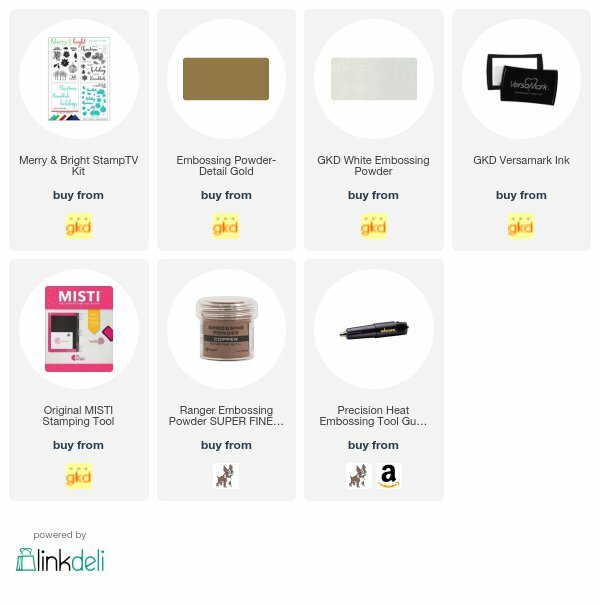 I'm enjoying your 12 Days of Christmas and seeing all the fantastic products. Gina K has such pretty sets. but they were well-worth it. That is an amazing kit. I love all three cards you made using the kit. Why must you tempt me with kits like this? I love that second set of stamps with the scripty words and all the pine boughs. It's gorgeous. I love the versatility of the pinecones! Beautiful cards, beautiful kit, love them. Love these cards. I agree having the white border looks very polished!! Stunning cards!!! Love your technique and in particular way I love so much these beautiful pinecones!!! I love all 3 cards you made! The pine one is my fav! It is something that I wouldn't think to make but now I will! I agree that the Merry and Bright Kit is a great deal! I have paid that much just for one Stamp & Die set! I also love how versatile the kit is! Wow, what a series of gorgeous and elegant cards! I especially love the first one - love the design! lovely cards and a fab kit! so inspiring! These are really gorgeous. Very elegant and festive. love all the cards. The black/gold is so elegant. Great looking kit. You cards are beautiful. I love this kit too. Goodness, these are beautiful creations Justine! Beautiful cards, Justine! Just ordered the kit; can't wait to get it. I absolutely love embossing, and your cards are the reason why. They look so elegant and professionally made. I like people to go “Wow” when they pull the card out of the envelope. And this Gina K designs kit is super elegant. Beautiful cards. I love the embossing detail. It's MAGIC. I love the look of the heat embossing on this card. Wow, these cards are all so elegant and special! I do think the white on blue is my favorite! Simple, yet so classy. These cards are stunning. I love the card kit & the copper pinecones are perfect. Every single detail of these cards are elegant and breathtaking! I especially love the trio of ornaments! WOW! TFS! Love this kit.. such a great deal. Beautiful cards Justine. Such gorgeous cards! I love the ornaments. So pretty. Love what you did with the pine cones. I received my Merry and Bright Kit and it is Fabulous! Filled with so many goodies. the christmas bulb is especially Beautiful! Happy Stamping! I love this kit but it doesn't fit into my budget, so I will just continue to drool........LOL Gorgeous cards! 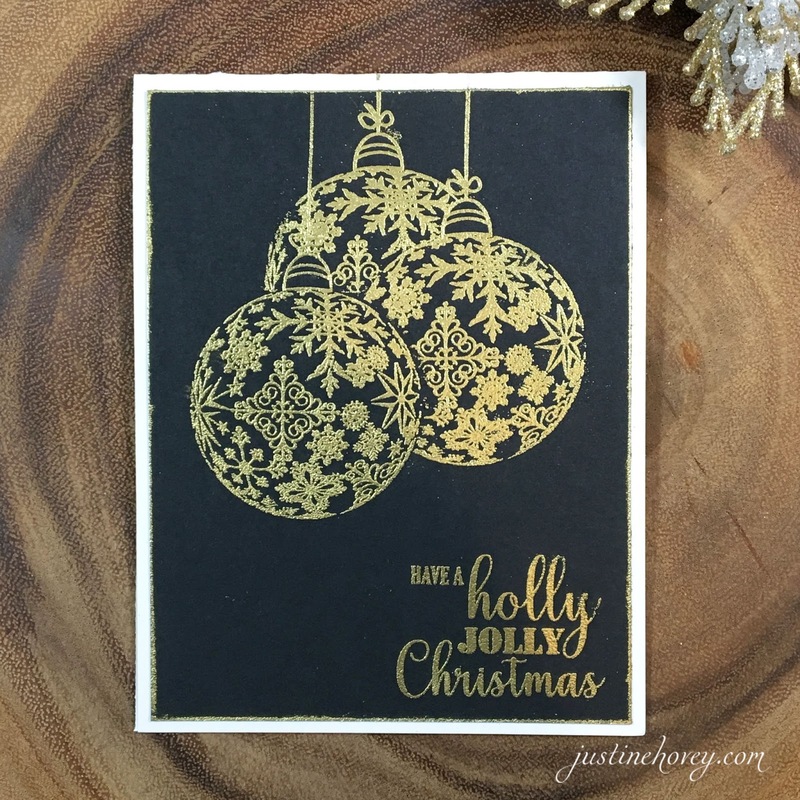 Love the gold on black and the copper pine cones! So elegant! Love all three cards but think the pine ones are my favorite! Thanks for sharing the video and thanks Gina K for sponsoring. Love your products. Three great cards! I love the way you created the pine cone background in bronze. Lovely versatile kit. Beautiful cards. I really like the blue with white. I gonna try that. I just LOVE that GinaK kit! I like what you created with it...especially the embossing. So pretty. thank you for sharing such beautiful cards. you know how to get us cardmakers into the card making spirit. Awesome cards! Hopefully the kit will be available again!! Such beautiful cards. I bought the Merry &bright kid and I am loving it! Followed Gina and made 2 cards last night so I will watch your videos and follow your instructions tomorrow! Thanks to you & Gina for a chance to win! The black and gold is beautiful I like being reminded of simple techniques like embossing. Great cards! Such stunning cards! Each very simple yet so detailed. The stamps that Gina k has come with are absolutely gorgeous, the make the card stand out from the rest. Love these cards! Gorgeous cards, my fav is the blue and white one, love it. WOW STUNNING.... I love the ornament stamp. Sometimes I feel my "mass produced" cards lack pizzaz or elegance, but this makes me rethink that. These cards are beautiful and this kit is fantastic! What a great value!! Oh my Justine...every card was just beautiful and so elegant. I just love what you create. Beautiful embossing - love the designs. I love the WOW of heat embossing. Great embossing. The white on royal blue is beautiful. The pines cones look great. My grandma gave me some copper embossing powder and I have had a hard time thinking of ways to use it. Great idea! Thanks for sharing all your beautiful cards. Oh, my goodness, that pine cone card is wonderful! 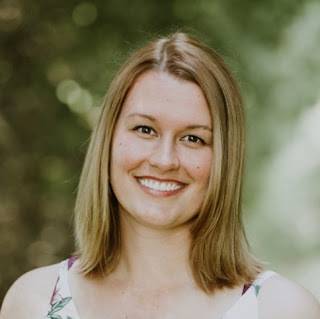 Gina K.kit is amazing. I normally don't do dark for Christmas cards but the ornament card is so elegant. All are gorgeous. Loved the first card with the ornaments. Very pretty! I like your masking of the first card. 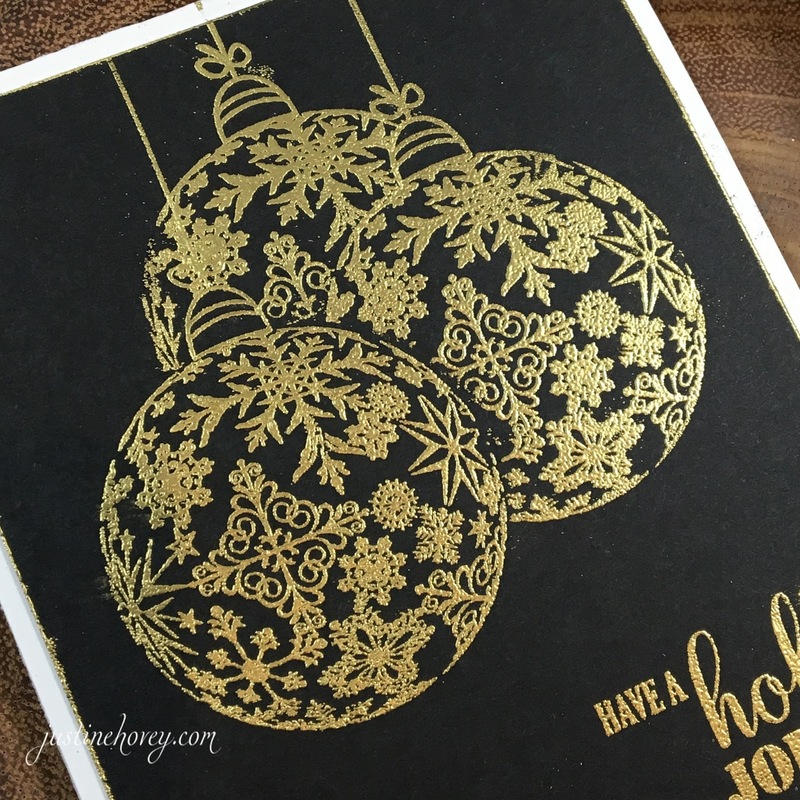 What a great kit by Gina K. And the cards are so beautiful...something about embossing that I just love! Beautiful cards!! I think the black one is my favorite. So elegant! I really like this kit. So many possibilities! I love the ornament stamp - so beautiful! Those ornaments look like they are going to pop off the page! However, I really love the blue and white card too! Love these cards! The black one with the gold ornaments is stunning! Beautiful cards. The first one came out so stunningly beautiful. That kit does look amazing and I love the cards you've created, particularly the white on blue.